What torque wrench should I buy? Which one will ensure accuracy? 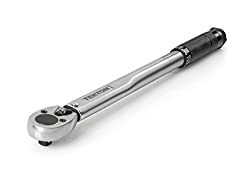 This torque wrench review article will show you the best torque wrenches of 2019. Many of the torque wrenches in this article are inexpensive and will help you with everything from car wheels to bicycle maintenance. A torque wrench is a valuable tool, however there are some things to keep in mind about it. For instance, you need to make sure to protect it from elements like dust which can ruin it. 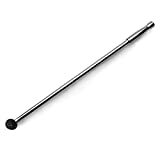 The market offers many torque wrenches that you can buy, and many can be used on your vehicle. Below is a list of the top 12 best torque wrenches of 2019. These 12 torque wrenches are all fantastic in their own way. 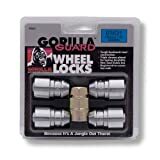 They can be used on your vehicle, such as car wheels and on your bike to do bicycle maintenance. Besides having these different abilities, there are some things you need to look at when buying a torque wrench. Each torque wrench is different and will each serve a slightly different purpose, such as this one. The drive on each torque wrench will tell you what nut and bolt size that specific wrench tool is best for. The drive is extremely important to look at as buying a torque wrench with the wrong drive could end up causing damage. Other things to look at especially are the size, performance, and price of a torque wrench. Below are product reviews of the 12 best torque wrenches and a little more about them and their features. Below are the 12 in-depth torque wrench reviews. This ½ inch drive torque wrench comes with a range of 10 ft.-lbs. to 150 ft.-lb. It features a high contrast dual range scale and a reversible ratchet head. This ratchet head has 24 teeth. This torque wrench also comes with a +/-4% accuracy. This will help to ensure you can tighten things like nuts and bolts without them breaking. This product will also give a loud click once the correct torque level is reached.When storing it, be sure to put it away at its lowest setting so it will continue to work properly. This product comes with a storage case. It also comes with a torque conversion chart. This is great because it will help you find and use the correct torque level. The loud clicking sound is very helpful as it will make sure you don’t tighten anything beyond its limit. This ½ inch drive torque wrench product from the ACDelco brand comes with 3 settings: torque, measurement, and mode. This torque wrench will work in both clockwise and counter-clockwise directions. It features an LCD display that will show you the current settings. Once you reach the correct levels, a buzzer will sound. One pro about this torque wrench is that it can measure with many different measurements. These include kg-cm, N-m, in-lb., ft-lb. This 3/8 inch drive torque wrench will easily snap-on to any piece of equipment you need to adjust. It has a high contract dual-range scale and a 24 tooth ratchet that’s reversible. There is a micrometer on the handle which you can use to adjust the torque. Its head moves in both counter-clockwise and clockwise directions and will measure in a clockwise direction. Once you reach the desired torque level, this torque wrench will give a loud click. It uses Nm and Ft.-lbs. measurements. The torque wrench from the TEKTON brand comes already set at a +/-4% accuracy. This means you can start to work with it immediately without having to adjust. It comes with a storage case to help protect it from any damage. It comes with a torque conversion chart to help with any measurements/conversions. Its measurement scale is easy to read, so you don’t have to worry about not being able to see the scale while using the tool. It does tend to break easily, so you might end up having to buy another one. This ½ inch drive torque wrench is made with chrome vanadium and chrome moly. It uses a spring loaded ball bearing to hold sockets tightly. It also has the ability to rotate 180 degrees. This makes it a great product to easily use with hard to reach areas and for untightening very secure nuts and bolts. This torque wrench comes with a lifetime warranty. The tool is 24 inches long, which helps you with reaching hard to reach areas. It is able to go up to 377 ft.-lbs. This ½ inch drive torque wrench is made of a heavy steel. It features a twist ring which allows you to lock and unlock the torque wrench. It has a rubber handle which helps you to keep a firm grip on the torque wrench when you use it. The scales on this product are engraved into the wrench and use both Nm and Ft.-lbs. measurements. It also comes with a +/- 4% accuracy when you buy it. This torque wrench can move both clockwise and counter-clockwise. It can be used with 20 ft.-lbs to 150 ft.-lbs. When you buy it, it has a +/- 4% accuracy already calibrated in it. This means you don’t need to worry about having to calibrate it once you buy it. The Craftsman brand is known for making tools with durability. This torque wrench has a long life and is durable. The rubber on the handle is a great feature. It will help you to keep a firm hold on the tool when you use it. This means you don’t have to worry about your hand slipping or not being able to fully move the torque wrench. Sometimes this torque wrench will break easily. It tends to rotate/move by itself even if you aren’t moving it. This ½ inch drive torque wrench features a 5 inch extension bar which can help you reach hard to reach areas. Also, once you have reached the maximum torque level needed, it will sound a loud click. It is made of steel and has the ability to move both clockwise and counter-clockwise. The handle also lets you adjust the torque level when using it. This product is best to use with 20 ft.lbs-150 ft.lbs levels. It comes with a high impact plastic case. This will help protect it from any damage. It is a cheaper option compared to many other torque wrenches. It will gradually start to wear out after a while. This means you might need to buy another one eventually. This 3/8 inch drive torque wrench comes with a reversible lock/unlock adjustment. It is shock resistant, heat-treated, and made with a strong chrome vanadium steel material. It has a 14 inch handle and the measurements are etched into the grip. Once you reach the desired torque level, a click will sound. It is able to measure in both Nm and Ft.-lbs. This torque wrench features a precise calibration which makes it easy to ensure accuracy. You don’t need to exert much pressure when turning this torque wrench. This is a very easy tool to turn and use. This torque wrench comes with a storage case to help prevent damage. It also has a low torque setting so you have the ability to use it on small objects. It comes at an affordable price, so it is a cheaper option compared to many other torque wrenches. The click that sounds is sometimes difficult to hear. While it does allow a low torque setting, this setting doesn’t always work accurately and may damage any object you’re working with. 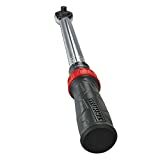 This ½ inch drive torque wrench from Snap-On has a torque wrench of 30 ft.-lbs. to 250 ft.-lbs. This Snap-On product is made of metal and has a plastic grip that you can hold when using this torque wrench. This torque wrench from Snap-On has a calibrated dual direction and a lock ring to keep the wrench locked in place. Because this Snap-Onmodel also has a quick release button, it helps to quickly and safely release the torque wrench from what it’s tightening. There is a laser scale on this Snap-On model that displays the current measurements/torque level. This Snap-On torque wrench will click once the correct torque level is reached. This Snap-On model is a cheap torque wrench choice. 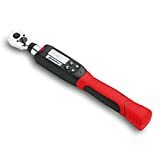 If you’re looking for a torque wrench to do small projects or one you don’t plan to use often, this Snap-On torque wrench is a good choice. This Snap-On torque wrench has a lock ring which helps to make sure it stays tightly on the object you’re working with. The spring in this Snap-On’s torque wrench lock ring sometimes doesn’t work very well. The plastic handle is sometimes hard to hold on to. On some occasions it’s difficult to read the laser scale on this Snap-On model. You have to be very careful when using this Snap-On torque wrench. If you damage it even slightly, it can ruin the accuracy which could cause damage to the Snap-On tool. This ½ inch drive torque wrench features a nickel and chrome finish and an easy grip to hold. It has an adjustable knob which helps to make sure your job gets done both safely and quickly. There is also a setting lock featured in this torque wrench. Once the desired torque level has been reached, the torque wrench will give a loud click. It works with a torque level of 40 ft.-lbs to 250 ft.-lbs. The handle is easy to hold, so you don’t have to worry about it slipping. You don’t have to worry about resetting it to the lowest setting after you use it. This torque wrench doesn’t have a reversible head, it only work in a clockwise direction. This means it won’t work well for certain projects, such as with automotive ones. The calibration of this product is not always accurate. This 3/8 inch drive stainless steel torque wrench has a torque range of 10 ft.-lbs. to 100 ft. - lbs. It contains a laser scale so you can easily see the current measurement levels. It has a dual scale calibrated dual direction. There are also quick release buttons that you can use to release the torque wrench safely and easily from the object. This torque wrench also gives a loud clicking sound once the torque level has been reached. The grip of this torque wrench is made of rubber. This helps ensure you don’t hurt your hands while using this torque wrench. It comes with a spring lock, which will help this torque wrench snap-on securely. It is a very expensive torque wrench. This ½ inch drive torque wrench is made of stainless steel and has a torque range of 20 ft.-lbs. to 150 ft.-lbs. It is LBS reversible and has a heavy-duty cam and pawl mechanism. Once the right torque level has been reached, a click will sound. It is a cheap torque wrench option compared to other torque wrenches on the market. It is good for basic and small projects, like tightening things on your bike. It’s not good for large projects or intense projects, so it can really only be used for small ones. Because it a cheaper torque wrench, it isn’t very durable and doesn’t have a long life. 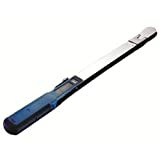 This ½ inch drive torque wrench product is made of chrome vanadium steel and has a mirror chrome finish. These two things help ensure that the torque wrench will be corrosion free and have a long life. The head can rotate 180 degrees which helps turning the torque wrench easier. The head also comes with a spring-loaded ball bearing to help make turning the torque wrench easier. It is made of strong materials so you don’t need to worry about it easily breaking or rusting. It comes with a 24 inch handle. This means you can easily reach hard to reach areas. It is great for loosening tough and stuck nuts and bolts. Sometimes the ball bearing becomes a little loose. It can break easily if you use too much force with it. This means this torque wrench is best to use with small objects. Below are four components to look at in a torque wrench before buying one. This is an important element to look at. You want to make sure the torque wrench you buy is a sturdy and tough one. Also, that it’s not too big or small for your project. A large torque wrench works best for certain project, just as a small torque wrench works best for other projects. For instance, a large one is a good one to use for automotive car and small one for things like bikes. When buying one, consider your project and whether you’ll need a large or small torque wrench. The construction is also important to keep in mind. You don’t want to buy a torque wrench that is not made well. One thing to look for in the construction is a finish on the tool. This finish helps seal the torque wrench. Also, a metal/steel torque wrench will often work better and have a longer life than one that isn’t made of it. Sometimes torque wrenches contain plastic which makes them not as sturdy as one that is made of heavier materials. Torque wrenches offer many different features and ranges. Because of this, it’s important to look for the right ones for your project. Some features to look at is if the torque wrench comes already calibrated. If the torque wrench is not already calibrated, you’ll have to do so yourself. You should look for a torque wrench that comes with a storage case. 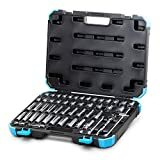 Also, a storage case will help protect the torque wrench from damage such as scratches and rust. Also, the grip is important to look at. Because you’ll have to turn the torque wrench with your hands, you want to make sure the grip is comfortable and easy to use. Another feature to look for is if the head is reversible, or “ratcheting”. 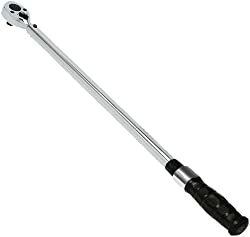 Ratcheting lets the head of the torque wrench move in either (or both) a clockwise or counter-clockwise direction. If your torque wrench does not have this ability, it could be hard to work with some objects and reach hard to reach areas. An easy-to read scale on the torque wrench is also crucial. If you are unable to clearly read the scale on it, the torque wrench could end up damaging the object it’s being used on. For instance, the Snap-On product listed above features a laser scale. Because this Snap-On model has an easy-to-read scale such as this, using this Snap-On product is easy and helps ensure safety. Also look at the manufacturer’s warranty of the torque wrench. If the warranty is not at least a year or so, this might mean the torque wrench will not have a long life. A long warranty is what to look for when you buy a torque wrench. Range (also known as drive) is important to look at when shopping for a torque wrench. The range indicates how small or large an object a torque wrench can be used for. Ranges will often come these sizes: 1/4, 3/8, 1/2, and 3/4 inches. 1/4: This is a good range for both small vehicles and objects. This is best for levels of 4 ft.-lbs to 21 ft.-lbs. 3/8: A good range for small/medium size vehicles and objects. The levels to use this with are 15 ft.-lbs. to 75 ft.-lbs. 1/2: This range is good for things like spark plugs and heavier vehicles. Use this range for levels of 30 ft.-lbs. to 250 ft.-lbs. 3/4: A range that’s not often needed except for very large and intense projects. The levels for this will exceed the ones that are mentioned above. Be sure to keep these ranges in mind when buying a torque wrench. Choosing the right range will help ensure your project is completed correctly. A torque wrench’s performance is important. The purpose of a torque wrench is to tighten nuts and bolts to make sure they are secure properly. It is important make sure that you don’t tighten them too much, because that could cause some major damage. A torque wrench needs to be able to tighten and secure these nuts and bolts accurately depending on what they are attached to. For instance, lug nuts needs a different torque wrench performance than a spark plug. It’s important to keep this in mind because you want to buy the torque wrench that will perform the best for your specific project. If the torque wrench does not work or perform properly, you can end up damaging the tool and the object you are working with. Just because a torque wrench is expensive doesn’t mean it’s better than an inexpensive one. There are plenty of good cheap torque wrenches on the market. Torque wrench prices range everywhere from being cheap to very expensive. This all depends on what you need it for. A cheap torque wrench is often best for small and basic projects. It’s mainly for when you occasionally need to use a torque wrench. However, an expensive one is ideal for when you need to use the torque wrench a lot. Because these torque wrenches also often come with more features and a heavy-duty build the price will be much higher. Not only do these tools come with different ranges and features, but torque wrenches come in different types and styles. Each of thesetypes and styles serve a specific purpose. Below are five types of torque wrenches you can purchase. This type of torque wrench is electronic and allows you to program it to the specific torque level that you need. It is similar to the electronic torque wrench as it uses a digital screen and also collect memory from previous usages. It also uses special sensor to help make sure that the angles and torque level needed are used correctly. This sensor is also known as an “electronic gyroscope”. You can program the torque level into the torque wrench and also lets you move it in many angles. Because you can program it digitally, you can save the memory, which will let you look back on the torque levels and angles you used once you’re done with using it. This helps with using the torque wrench in hard to reach places. 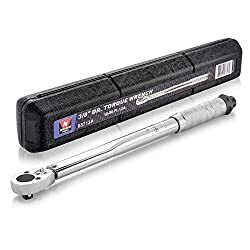 This type of torque wrench is great for using on vehicles. For instance, if you need to tighten or remove spark plugs, a click wrench would be a good choice for you. One reason why it’s great for vehicle use because you don’t have to see the torque level to know when it’s been reached. So, if you’re under a car with it, you just have to wait for the clicking sound. A click wrench lets you use a clutch to secure it onto an object. It lets you adjust it so that you don’t over torque the object, which can lead to damage. Usually once you’re done using a click wrench you need to reset it back to the lowest setting. A hydraulic torque wrench is best to use with large objects. These are usually used with heavy duty machines and extremely large nuts and bolts. These hydraulic torque wrenches are also known for being great with providing the correct accuracy for a project. A hydraulic torque wrench is ideal for construction work or if you work with large and heavy machines. This torque wrench has a beam indictor on it, which kind of looks like thermometer. The beam indicator will show you the current torque level. However, you have to pay attention to the levels as there is not a sound to indicate once the right torque level has been reached. It also tends to be a little heavy. This is good for if you don’t plan to use a torque wrench and only need one occasionally. 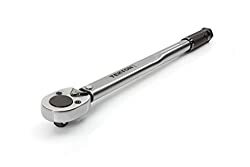 They also are a cheaper torque wrench option compared to other torque wrenches, so if you are on a budget beam wrenches are usually the best choice. An electronic torque wrench is similar to a click wrench except it has a few differences. One notable difference is the sound. Instead of a clicking sound to indicate you’ve reached the desired torque level, it makes a beeping one. Because it’s digital, it has a digital display and also can keep memory. The display is often LED, which means it will be easy for you to read. Also, because it keeps memory, it can review previous torque levels. You can save this memory on a memory card. However, keep in mind that these are often expensive. It’s important to use precautions when working with a torque wrench and also to protect the wrench from damage. Below are some usage and safety tips to keep in mind when using this tool to secure things on bikes, cars, or machines. Having a torque wrench means there’s a lot of usage tips and rules to remember to ensure accuracy and safety. One tip is that when first using your torque wrench, you need to make sure the torque accuracy is correct, as well as the measurements. If these aren’t, your torque wrench could break or damage the object you’re working on. Also, make sure to only use this tool on objects that it is intended to be used for. If you don’t, you could end up breaking both the tool’s torque levels and the object. Another thing to keep in mind is that when using the torque wrench on an object, use the correct force.For instance, the right force for spark plugs will bea different force compared to certain bolts. If you use too much or too little force, that could damage the object or even not tighten it enough. Be sure to also move the wrench in the direction indicated on the tool itself. By not doing so, it could some serious problems. Some other things to keep in mind when using a torque wrench is to not try to make it fit on tools or use heads that don’t fit properly on it. If you do these things, the torque wrench won’t work properly and can cause damage. When moving the torque wrench, hold it in the center of the handle. If you hold it too high or too low, it could slip and cause damage to not only the tool and object, but also injury to yourself. Once it beeps or clicks you want to stop moving the tool. By going using it even a little more after the tool sounds, it will end up adding too much torque to the object and can damage it. It’s also important to not use the torque wrench to constantly loosen things. While you can do so occasionally, the torque wrench is intended more to tighten things. You also want to make sure not to put oil, grease, or water on it as these can ruin your torque wrench. Once you’re done using your torque tool, be sure to store it in its lowest setting. Then, put it in its storage case and store it away in a clean and dry place. You should occasionally check the tool to make sure it’s working properly and that it’s not rusting. When using a torque wrench, there are some things you should remember to keep not only your tool safe, but yourself. While using the torque wrench make sure it’s on its correct torque level. If the tool is under or over, it can either tighten the object too much or too little. This could cause some serious problems if the object too tight or not tight enough. You should also make sure to not keep moving the torque wrench after the beeping or clicking sound. Once it sounds, immediately stop. Be sure to also move the torque wrench in the correct direction. Depending on the tool, you might only be able to move it clockwise or counter-clockwise. By not moving it in the correct direction, it could not tighten things correctly and could slip. Also make sure to not put any extensions on the torque wrench. If you do, it could damage the tool and the torque. It could also slip from the object. You should also make sure to reset the torque wrench to 0, or its lowest setting, before using it on another object. If you don’t, the torque will still be the same level as your last project. By keeping it also at the current torque level it could ruin the tool. You also sure make sure to wear safety googles while using a torque wrench, just in case it happens to slip or fall. Another safety tip to keep in mind is to check your torque wrench every so often. By doing so you can help prevent injuries and damages. Torque wrenches come with many different types of measurements that you can use. These can be a little confusing though, which is why many torque wrenches come with a conversion chart. While the torque wrenches above typically used ft.-lbs. or Nm measurements, there are some other ones: In. - lbs. (inch to pounds) In. - ozs. (inch to ounces) Ft. - lbs. (foot to pounds) Nm (Newton meter) cNm (Centi-Newton meter) Often to find the right torque measurement, there is a formula that you can use. You can multiply the length of the tool times the force which will give you the correct torque level. It is vital that you use the correct torque levels and measurements for your project. If you don’t do this, you could end up having many problems such as not tightening it enough or too much. You could also have the problem of not tightening it straight. If you don’t tighten the object enough, it could end up falling off which will cause the object it is attached to fall off. By tightening something too much it could end up breaking. If this breaks, it can also damage the object that it was attached too because it was on it too tightly. If you tighten an object unevenly it can rub against the object it is on. This can cause not only the nut or bolt to become damaged, but also the object it is moving against. While many of the torque wrenches mentioned above come pre-calibrated some don’t. This means you will have to calibrate the torque wrench yourself, which can sometimes be a difficult process. Depending on the type of torque wrench you have, calibrating it will be a certain way. This is why it is important to review the owner’s manual that comes with your torque wrench. After you successfully calibrate your torque wrench you can test the calibration. There are three different main types of calibration testers for torque wrenches. These are mechanical, hydraulic, and electronic. Each one will help measure and test your torque wrench calibration and make sure your torque wrench is working properly and ready to use. This torque wrench review article tells of the 12 torque wrenches you should consider using. Each of these torque wrenches has a different purpose as well as different features. All torque wrenches are not the same, so it’s vital you look at things likes their range, features, and types. The range will tell you how much torque you can except to get. The various features on a torque wrench will help you with your project. The types of torque wrenches are also important as each type has a specific purpose. When shopping for a torque wrench, be sure to especially keep these three things in mind. By doing so, you can help ensure using your torque wrench will go smoothly and safely. This torque wrench review helped show you the best torque wrenches to buy and why. Keep the previous reviews and tips in mind when you are shopping for a torque wrench. Also, be sure to consider purchasing one of the good torque wrenches from this review.